On November 28, the Delhi High Court issued a notice to the National Capital Region Planning Board (NCRPB) acting on a public interest petition. The petition accused the board of allowing unsustainable and haphazard development in the region by violating the Regional Plan 2021. The court has also sought replies from the Union Urban Development Ministry and the governments of Delhi and adjoining states of Haryana, Uttar Pradesh and Rajasthan. While the case will be heard in January, environmentalists and town planners point out that NCRPB is quietly making changes in the Regional Plan 2021 to regularise the violations. During a mid-course revision of the plan, it diluted several environmental safeguards, which would allow urbanisation and industrialisation of eco-sensitive areas. If implemented, analysts say, the revised plan would sound the death knell for the region’s ecosystem, already on the brink. Small wonder that since July when NCRPB put the revised draft of the Regional Plan 2021 on its website for public comments, it has attracted more than 400 objections from the general public, environmentalists, city planners and those who were part of the consultative process to revise the plan. An analysis of the objections shows that NCRPB has omitted an entire paragraph—17.4.1—on creating green cover from the earlier plan. The section recommended creating green belts of the width of a revenue village wherever possible along the National Capital Territory, green buffer along the highways and railway lines, and marking eco-sensitive zones along the Yamuna. While revising, planners at NCRPB have also removed the word “forest” from the section on land use and replaced it with “green cover”. By doing so, NCRPB does not need to seek permission under the Forest Conservation Act for diverting forestland for non-forest purposes, and it can change the land use at will in future, says Chetan Agarwal, a Gurgaon-based environmentalist who was part of the consultative process for revision of the plan. NCRPB is already changing the land use at will, especially from green areas to commercial and residential areas, according to Pradeep Kharbanda, a town planner from School of Planning and Architecture in Delhi. He has filed 14 objections against the revised draft. “This is against the NCRPB Act. But NCRPB is doing so to facilitate greedy builders,” Kharbanda alleges. 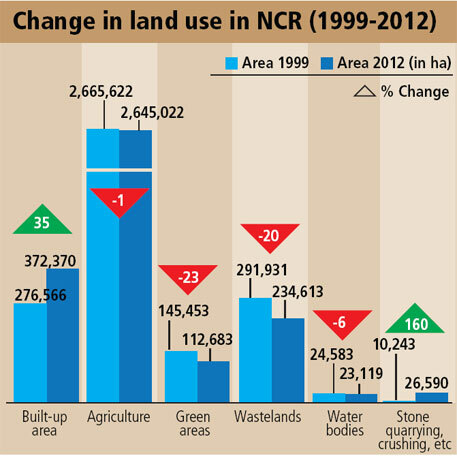 NCRPB’s own data shows between 1999 and 2012, built-up areas and landfills across NCR have increased by 34.6 per cent and that under stone quarrying and crushing by 160 per cent. This is when the extent of forests and green cover and that of water bodies have reduced by 22.5 and 5.9 per cent respectively (see ‘Change in land use...’). To facilitate infrastructure developers, NCRPB has also omitted a crucial guideline that restricts construction in the Natural Conservation Zone (NCZ)—eco-sensitive areas such as forests, biodiversity hotspots and cultural heritage sites. It allowed 0.5 floor-area-ratio (FAR is the ratio of building’s total floor area to the size of the plot) in NCZ. The restriction was introduced in the original plan after satellite images showed rampant construction activities in eco-fragile areas such as the Yamuna riverbed, wetlands, the Aravalli mountain range, ridge areas and forests. Agarwal says the removal of 0.5 FAR cap will jeopardise NCZ. Any further construction will mean high population density. And this will mean more roads, boundary walls, tube wells, electric poles and more diesel gensets that cause noise and air pollution. This will irrevocably fragment the eco-sensitive area and disturb the wildlife habitats and corridors. This will also violate the National Forest Policy of 1988 that calls for keeping one-third of the country under forests, Agarwal says. Only 6.2 per cent of NCR is under forest cover against the national average of 22 per cent. Agarwal points out another loophole in the plan: NCRPB is yet to demarcate NCZs. Sarvdaman Oberoi of the non-profit, Mission Gurgaon Development, points out omission of another sentence that restricts change in land use. Master plans for towns in NCR should incorporate an analysis of land suitable for settlement, agriculture, forestry and industry. The earlier plan stated further growth should be channelised in areas, suitable for settlement growth. But the revised draft says land suitability analysis is required only for new master plans. This will exclude existing master plans and expansion of towns that form the bulk of the development activity in NCR, Oberoi says. Analysts say if the revised Regional Plan 2021 is implemented, the Aravallis, the world’s oldest mountain range, would be the hardest hit. A clause in the earlier plan restricted mining of stones and other minor minerals in the Aravallis in NCR. The clause is missing from the revised draft. “This will remove the protection for the Aravallis and gair mumkin pahar (no-go areas in the hills) in Faridabad district and leave them vulnerable to construction activities, which is contrary to their eco-sensitive status,” Agarwal states in his objection to the revised draft. The revised draft also downplays the ecological importance of the Aravallis. “The natural forests, plantation forests and sacred groves like Mangar Bani of the Aravallis act as wildlife corridors between Asola Bhatti Sanctuary in Delhi and Sariska National Park in Rajasthan,” says Agarwal. The earlier plan recognised this. The revised draft describes the Aravallis as follows: “The major portion of forest areas in Aravalli section of Gurgaon and Faridabad in Haryana sub-region, mainly pass through agricultural fields or wastelands.” Agarwal and several other conservationists demand a change in this definition. On the day NCRPB approved the revised draft, it revealed that by March 2013, it had provided loan to 277 infrastructure projects, worth Rs 18,994 crore, across NCR. In the Haryana sub-region alone, it sanctioned a loan of Rs 2,581 crore for 106 projects. On being asked if this is the reason some sections have been diluted, NCRPB officials told Down To Earth that it is incorrect to call these revisions a dilution of the Regional Plan. These changes have been made in the presence of all the stakeholders, the officials said.